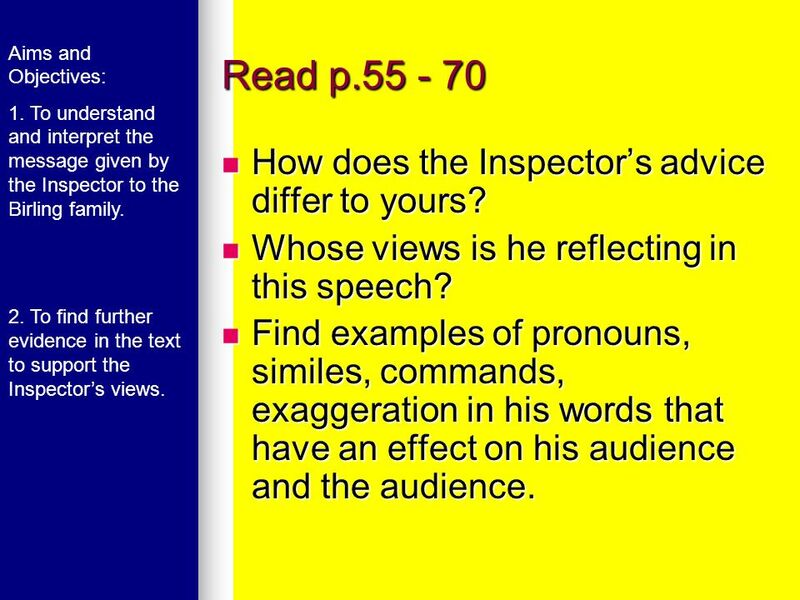 3 Read p.55 - 70 How does the Inspector’s advice differ to yours? Aims and Objectives: 1. To understand and interpret the message given by the Inspector to the Birling family. 2. 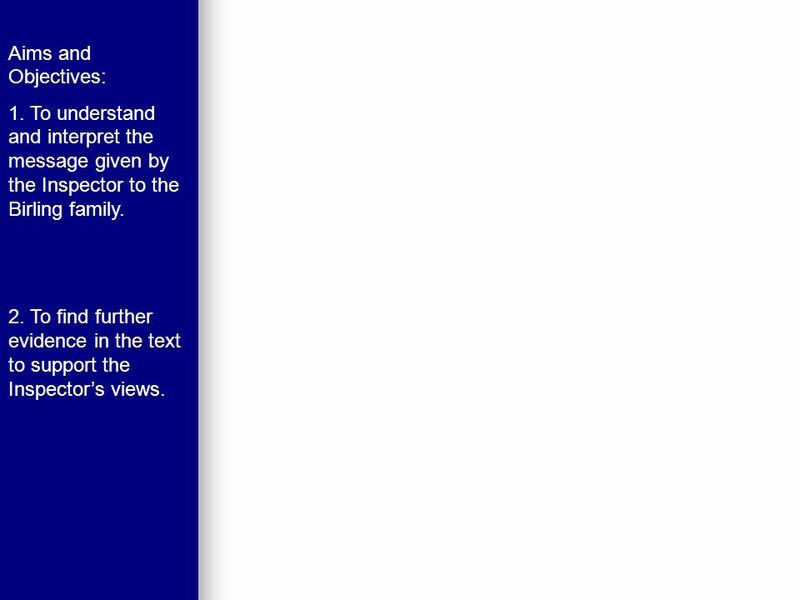 To find further evidence in the text to support the Inspector’s views. 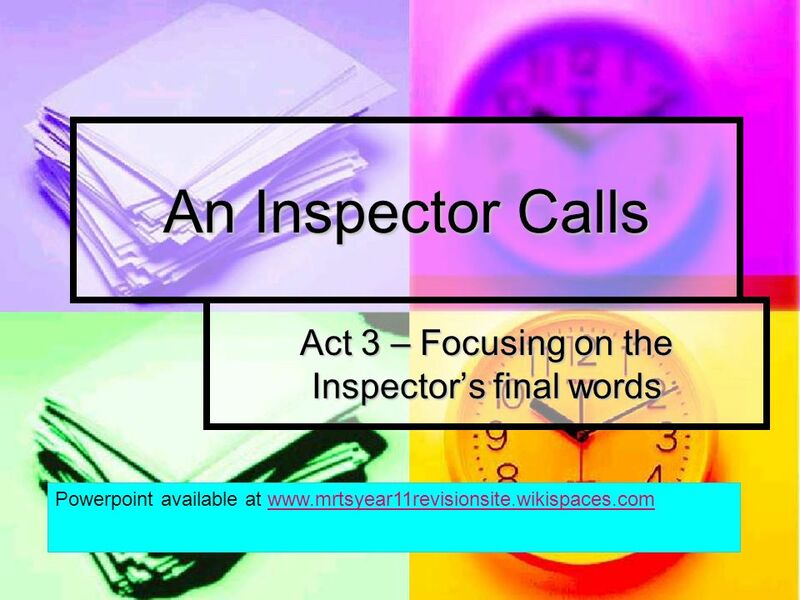 Read p How does the Inspector’s advice differ to yours? Whose views is he reflecting in this speech? Find examples of pronouns, similes, commands, exaggeration in his words that have an effect on his audience and the audience. 4 Aims and Objectives: 1. To understand and interpret the message given by the Inspector to the Birling family. 2. To find further evidence in the text to support the Inspector’s views. 6 Key Notes Simile – ‘as if she were an animal’. Aims and Objectives: 1. To understand and interpret the message given by the Inspector to the Birling family. 2. To find further evidence in the text to support the Inspector’s views. 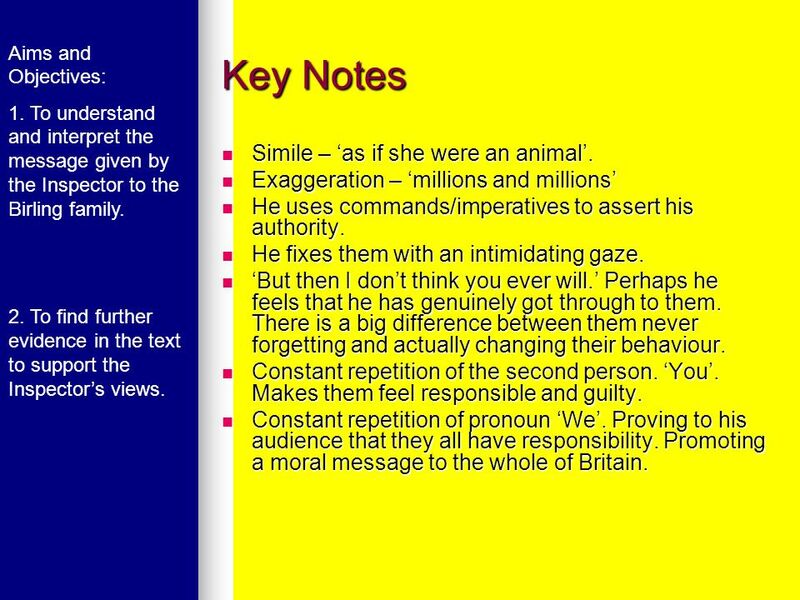 Key Notes Simile – ‘as if she were an animal’. Exaggeration – ‘millions and millions’ He uses commands/imperatives to assert his authority. He fixes them with an intimidating gaze. ‘But then I don’t think you ever will.’ Perhaps he feels that he has genuinely got through to them. There is a big difference between them never forgetting and actually changing their behaviour. Constant repetition of the second person. ‘You’. Makes them feel responsible and guilty. Constant repetition of pronoun ‘We’. Proving to his audience that they all have responsibility. Promoting a moral message to the whole of Britain. 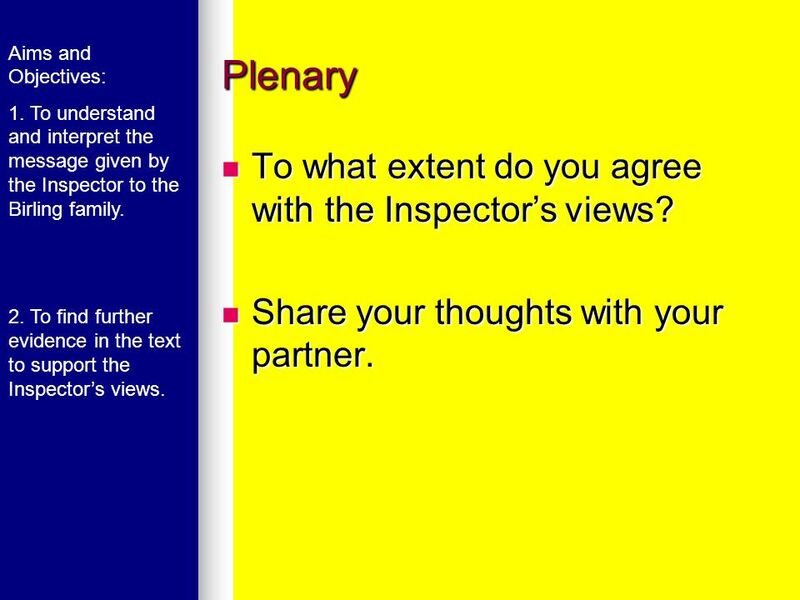 7 Plenary To what extent do you agree with the Inspector’s views? Aims and Objectives: 1. To understand and interpret the message given by the Inspector to the Birling family. 2. To find further evidence in the text to support the Inspector’s views. Plenary To what extent do you agree with the Inspector’s views? Share your thoughts with your partner. 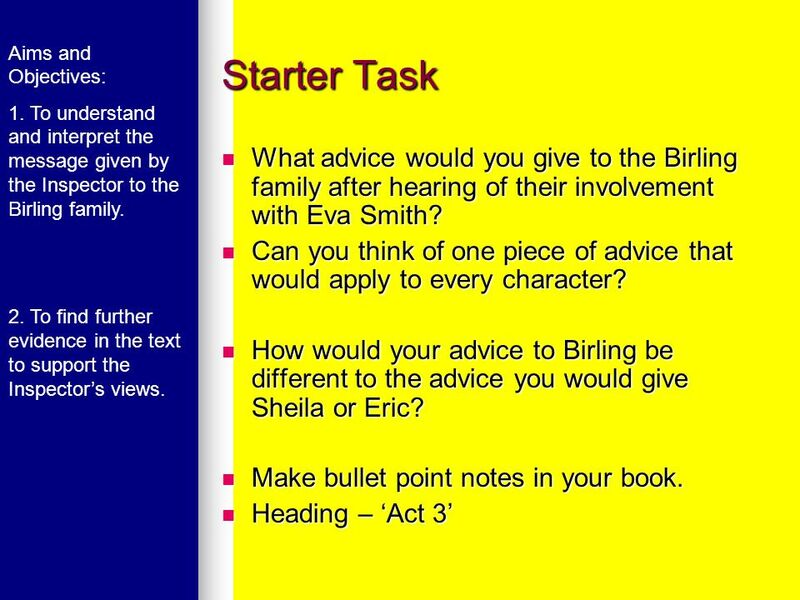 Download ppt "Act 3 – Focusing on the Inspector’s final words"
Objective To describe the structure of a comparative essay and construct examples. Outcomes  B Identify, explain and evaluate important events in the. ‘He inspected us alright’ Who said this? What is meant by this quote? Who is the most interesting character? Which one would you feel most comfortable about discussing in an essay? Sample exam question: How does JB Priestley. Introduction Who wrote the play? J.B Priestley J.B Priestley Born in he was brought up in his father’s socialist circle of friends. Born in he was brought. “Dear Bully” What is a little surprising about the bully situation in the first entry? Evaluate the ending of the entry; What is ironic about the way it. Point of View The character or observer who tells the story. The narrator. A skilled author can suppress his own feelings and get across the feelings of. “A CALL TO CRUSADE” A Close Reading. LEARNING TARGETS:  Use the strategy of close reading to deeply understand and analyze the text  Cite strong evidence. 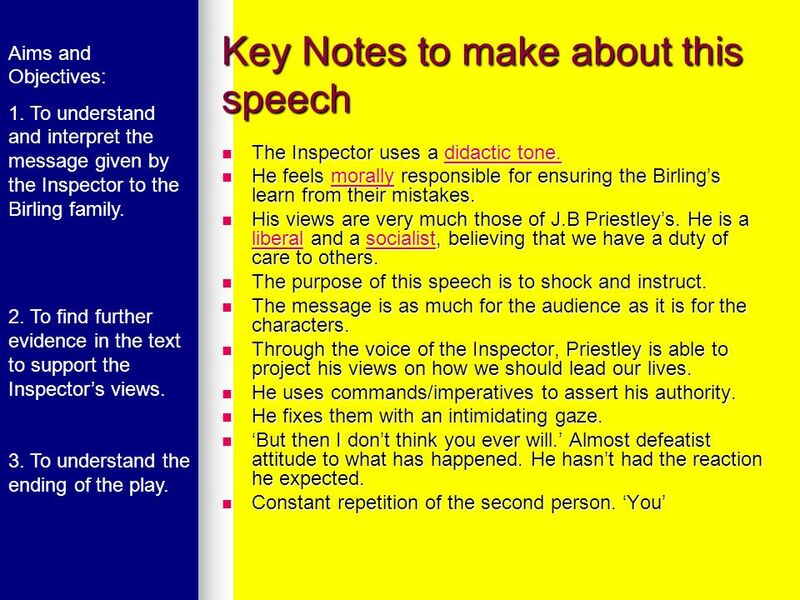 An Inspector Calls Revision Quiz. To revise and consolidate our knowledge of ‘An Inspector Calls’. Kelso High School English Department. Can you ‘Beat the Inspector’?